Mooie afsluiter van 2012 en opsteker voor Urgenda en hun Wij Willen Actie aanpak. De Amerikaanse rechtbank herbevestigd de uitkomst van een rechtszaak uit 2006 dat EPA CO2 mag reguleren op basis van Clean Air Act. An appeals court in D.C. today rejected an attempt by the fossil fuel industry to gut a critical EPA pollution rule. In 2007, the Supreme Court ruled that the agency had the authority under the Clean Air Act to regulate greenhouse gases, including carbon dioxide, as pollutants. Since that point, as the EPA has struggled to implement various rules limiting such pollution for both new and old power plants, there have been a series of court battles over its authority. The ruling today is not the final word, but is nonetheless an important victory. The U.S. Court of Appeals for the District of Columbia voted 6-2 to reject a request for the full court to reconsider a June ruling that upheld EPA’s interpretation of the Clean Air Act. The environmental policy debate has been taken over by climate change for years. With some backlash lately because of climate denialism. Most discussion about climate change focus on reducing the emissions of carbon dioxide into the air. In this post I will argue that it is better for both public health and fighting climate change to shift focus to non-CO2 greenhouse gases and air pollution for the short term, leaving the reduction of actual CO2 emission to the future. Do I hear some climate fighters cry wolf already? A few years ago I attended a workshop about the interconnection between transboundery air pollution and climate change. The research presented showed it might be more effective to combat climate change by combatting soot and air pollution (like nitrogen oxides and methane). Carbon black, as soot was called by the researchers, is formed mainly through incomplete combustion of both fossil and biofuels. The researchers told that part of the carbon black rains down in snowy areas, where it turns the snow darker. Thereby increasing the amount of solar radiation absorbed, thus raising the temperature of the snow which makes it melt… That’s one good reason to focus on reducing air pollution by carbon black for The Netherlands. A second good reason to focus on carbon black has to do with human health. Carbon black is associated with a lot of human health problems ranging from asthma to heart diseases. Human health can be an important driver for environmental policy and a researcher from the Dutch Environmental Agency (PBL) recently wrote an article suggesting reducing soot can be very effective to improve impact from air pollution on human health. to achieve levels of air quality that do not result in unacceptable impacts on, and risks to, human health and the environment. Especially because the scientific evidence that smaller carbon black particles have more adverse health effects. Those small particles are not yet regulated, but local politicians know that their citizens are worried and either use it in their campaign or reject to build schools and houses next to highways. The carbon use efficiency can be increased by reducing ozone concentrations at ground level. Ozone is formed as a result of other air polluting emissions, mainly volatile organic compounds (VOC’s, such as methane) and nitrogen oxides. Both are emitted by burning fossil and biofuels. But VOC’s are also released during transport and storage of fossil fuels, and some of them, like methane, are very potent greenhouse gasses. So considering the fact that non-CO2 greenhouse gases (like methane) are responsible for over 50% of the greenhouse effect focussing on air quality to combat climate change is less strange then it looks on the outset. The solution to the above problem for the long term is to decrease the amount of combustion fuel needed by increasing the production of sustainable energy that don’t need combustion and electrification, like electric cars. The short term solution is to use innovations at hand to reduce the emissions of air polluting substances like VOC’s, carbon black and nitrogen dioxide. Several Dutch companies can provide such solutions and research shows that providing them a home market is very favorable to gain traction on the world market. So let’s show some examples of Dutch companies that can provide world class solutions to combat air pollution. The VentoClean-System is a special explosion proof machine for the degassing and recovering of hydrocarbons out of tanks and hoses in the shipping industry and bulk storage. It has been developed to clean tanks and hoses from gases and residues quickly after the tanks have been emptied. Through a condensation process gases and residues are brought back to the original product in liquid form very quickly. The high speed together with the high ventilation capacity of the system are also caused by bringing back a higher optimum temperature in the tanks and hoses, this temperature is re-used from the condensation process. The VentoClean-Systems had advantages for both people, planet and profit. To start with the profit part: In short the VentoClean-System saves costs and increases turnover. By using the VentoClean-System the tanks are immediately employable, washing is not necessary and there is hardly any waste or slobs. As the system can be used independent from location and time, ships that have been equipped with the VentoClean-System become more flexible and are employable more rapidly. The extra shipping hours caused by ventilation can be brought back, port and lock costs can be reduced and a backload can be loaded more often. The gains for the planet consist of less waste or slobs, less washing of tanks and reducing the need for ventilation in open air decreases air polluting emissions. Less air polluting emissions is also good for people, as the system can also be used to clean tanks containing carcinogenic substances like benzene. Accede has developed a concept they call Cairbags for use in tanks. This short movie explains how Cairbags work. A Cairbag is an aircushion that is installed and inflated in the container of the trailer or truck, especially if the container is only partially filled with a liquid load. The Cairbag fills at all times that space that is not filled by the liquid, preventing the presence of free air. The effect of the Cairbag is that it decreases the emission and evaporation of liquids in a partially or fully filled tank. Therefore the Cairbag contributes to better air quality along shipping routes, both coastal and inland. A Cairbag also increases the fuel efficiency for trucks that use them. 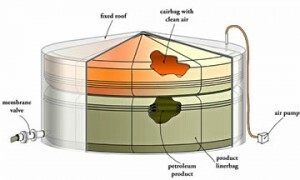 Cairbags can also be used in tank terminals to reduce emissions to air. When they are combined with a Linerbag emissions to both air and groundwater can be reduced to (almost) zero. Leaving a larger volume of products to sell and increasing air quality in the surrounding area. Greentec Oils increases the fuel efficiency of existing engines and reduces the emission of both nitrogen oxides and soot. This is done by a combination of a special biobased oil, adjustments to the engine which make it run smoother and an addendum to improve fuel quality. Confidential data I’ve seen show generators use 10% less fuel and emission from soot and nitrogen oxides are reduced up to 80%. HMVT is developing the Corona Air Purification system together with Eindhoven University of Technology (TUe) and Oranjewoud. The name Corona refers to the phenomenon of air conducting electricity under the influence of a powerful electric field without making a full discharge circuit. The Corona Air Purifier cleanses vapours with the help of pulsed high-voltage electricity, also known as Pulsed Power. The Corona Air Purification system can remove substances like VOC’s, nitrogen oxides, particle matters and traffic emissions with rates ranging from 50% up to 99%. First and foremost the current separation between air quality and climate change policy should be reconsidered. People are much more likely to act on air quality, as air pollution has a direct effect on both human health and agricultural output and can have a profound and almost immediate effect. Both local and national authorities can play their part by not settling for a C minus for air quality. On the second place a home market for the above mentioned companies can be created. One of the main lessons from research to the critical success factors for clean tech done by both the European Union and World Wildlife Foundation is that a home market gives a large competitive advantage to clean tech companies. Nothing is more convincing and compelling for foreign customers than being able to show that your technology is being used in your own country. After all a sales pitch containing the phrase this technology is not yet used (or not even allowed) in my own country will not be very convincing, of even a sales pitch at all! Creating a home market requires more than providing innovation subsidies or R&D funding. It requires an environment where government and entrepreneurs form partnerships to bring technology to the market. Also Dutch government should take an active role in setting at least European standards for clean tech, as we’ve recently done for electric cars. So let’s hope some we’ll see some Dutch clean tech on the Catwalk for Innovation next month. This post was originally witten for and published by TEDxBinnenhof. Thanks to my former collegues for pointing me to the companies and research mentioned in this post. And to Ivo Stroeken, Advisor Electric Transportation, and Max Herold, owner at Managementissues.com for critically reviewing draft versions. Zijn eisen aan de scheepvaart slecht voor de economie? De Club van 30 had gisteren een artikel staan over de effecten van de nieuwe luchtkwaliteitseisen voor de zeescheepvaart op het Nederlandse bedrijfsleven. Volgens de nieuwe luchtkwaliteitseisen het zwavelgehalte van scheepsbrandstoffen wereldwijd dalen, waarbij er aanvullende eisen gesteld kunnen worden in zogenaamde SECA gebieden. Waar de Noordzee ook toe behoort. Bernard ‘duurzaamheid is innovatie‘ Wientjes stelt volgens de Club van 30 in een brief aan Staatssecretaris Atsma dat deze aanvullende maatregelen slecht zijn voor de scheepvaart en voor de staal en papierindustrie in Nederland. Om te beoordelen of dat klopt lijkt het me verstandig om te bezien wat de maatregelen inhouden, welke redenen er zijn voor de maatregelen en mogelijke alternatieve maatregelen om de doelen te halen. een afname van het zwavelgehalte tot 0,50 gewichtsprocent tegen 1 januari 2020, behoudens herziening in 2018, met mogelijk uitstel tot 2025. Waarom is de maatregel nodig? In 2001 hebben de lidstaten van de EU zich gecomitteerd aan de het programma schone lucht voor Europa (Clean Air For Europe). Het einddoel daarvan is dat de luchtkwaliteit dusdanig moet verbeteren dat er geen merkbaar effect meer is van luchtverontreiniging op gezondheid en milieu. Om de doelstellingen uit CAFE te bereiken worden de luchtverontreinigende emissiesbinnen de Europese Unie vanuit verschillende hoeken gereguleerd. Aan de ene kant gebeurd dit door grenzen te stellen aan de hoeveelheid emissies, de concentratie van luchtverontreinigende stoffen en de neerslag (deposito) van luchtverontreinigende stoffen. Aan de andere kant worden de luchtverontreinigende emissies gereguleerd door bronbeleid. De absolute hoeveelheid emissies per land worden begrensd door de Nationale Emissieplafonds uit de Nationale Emissie Plafond-richtlijn, waar de luchtvaart en zeescheepvaart niet onder vallen. De maximale concentratie luchtverontreiniging op een bepaald tijdstip op een bepaalde plaats wordt begrensd door de Kaderrichtlijn Luchtkwaliteit, waar luchtverontreiniging veroorzaakt door de luchtvaart en zeescheepvaart wel meetelt. De hoeveelheid neerslag van luchtverontreinigende stoffen wordt in bepaalde gebieden gereguleerd door natuurwetgeving (Natura 2000). De afgelopen decennia hebben grote reducties in luchtverontreingende emissies plaatsgevonden, waardoor de luchtkwaliteit aanzienlijk verbeterd is. Zo wordt de luchtkwaliteitsnorm voor zwaveldioxide al jaren gehaald (bron: Compendium voor de Leefomgeving). Tegelijkertijd zijn er nog aanvullende maatregelen nodig om de lange termijn doelstellingen van CAFE te halen (bron: kamerbrief Milieubeleid industrie na afloop milieuconvenanten). Met het huidige zwavelgehalte (1,5 %) was de zeescheepvaart op het Nederlands deel van de Noordzee in 2009 goed voor 51% van de zwaveldioxide-emissies (SO2) (bron Compendium voor de Leefomgeving). Bij een verwachte toename van de zeescheepvaart neemt de emissie van SO2 door de zeescheepvaart de komende jaren verder toe. Voor een beeld van het huidig effect van de zeescheepvaart op de SO2 emissies zie dit artikel in The Guardian. Natuurlijk is het mogelijk om de doelstellingen op een andere manier te halen. Industrie, landbouw en wegverkeer hebben de afgelopen 30 jaar echter al grote stappen gemaakt in het verlagen van hun luchtverontreinigende emissies, met name de emissies van SO2 zijn fors gedaald. Extra reductie in die sectoren is daarmee relatief duur. De scherpere eisen aan brandstoffen op de Noordzee zijn naar mijn mening dan ook een logische stap om de emissie van zwaveldioxide op het Nederlands grondgebied verder te verlagen en passend bij het principe de vervuiler betaalt. Tenzij de voorman van VNO-NCW bedoelt dat de doelstellingen uit CAFE aan de wilgen gehangen moeten worden…? De aftrap is aan een presentatie op TED. Dat is altijd een mooie bron van inspiratie, zeker als je behoefte hebt aan wat anders dan de zwart wit tegenstellingen die de boventoon lijken te voeren in het openbaar debat. In onderstaand filmpje laat Natalie Jermijenko een aantal mooie voorbeelden van omdenken zien. Waarbij de stadse omgeving voor mens en milieu verbeter en er ook nog werkgelegenheid wordt gecreëerd. De voorbeelden komen uit haar Environmental Health Clinic. Welke van deze voorbeelden zijn volgens jou bruikbaar voor Nederlandse steden? Dire messages about the impact of global warming may increase scepticism because they contradict a commonly held belief that the world is a just and orderly place. This is the conclusion of new psychological research which investigated the reaction of individuals to messages about global warming. Despite the increasing amount of scientific evidence for global warming, there appears to be an increasing number of people who consider global warming to be non-existent or unrelated to human activities. Public appeals to increase pro-environmental behaviour often emphasise the severity of potential impacts of climate change. Ironically, it could be that these appeals are increasing scepticism in global warming. The study investigated the role of ‘just world beliefs’, which are beliefs that the world is a fair and orderly place where rewards and punishments are delivered to those that deserve them accordingly. Information on the devastating impacts of climate change can threaten these ‘just world beliefs’, as they suggest a chaotic future in which innocent children will suffer. In order to hold onto their beliefs, individuals may deny or discount the evidence of global warming, resulting in increased scepticism and ultimately a decreased willingness to change their behaviour. Using a sample of undergraduate students in the USA, the study indicated that the greater the belief in a just world, the more likely participants would become sceptical about climate change after reading a newspaper article that detailed the devastating consequences of global warming. However, if they read an article that communicated some positive messages in terms of finding solutions to carbon emissions, then the level of belief in a just world had no effect on scepticism. The researchers further investigated the link between just world beliefs and scepticism about global warming. They experimentally manipulated the level of belief in a just world by exposing participants to just world beliefs in a language comprehension test. They discovered that those who had been exposed to just world statements demonstrated higher levels of scepticism after watching a 60 second video with a dire message about global warming, compared with those who had been primed to believe in an unjust world. Those exposed to just world beliefs were also less willing to change their lifestyle to reduce their carbon footprint. The research indicates that dire messages about global warming which aim to encourage pro-environmental behaviour could in fact backfire and produce more scepticism and less positive behavioural change. This could be because the message challenges deeply held beliefs about the fairness of the world. However, if messages are delivered in a positive frame that refers to potential solutions then beliefs in a just world are not confronted so strongly and we remain open to global warming and our ability to contribute towards mitigation. The study only involved Americans and researchers suggest that Americans may hold stronger just world beliefs than other nationalities. More research in this area is needed with other populations and to investigate more specifically which part of just world beliefs, e.g. fairness or predictability, conflict with negative global warming messages. Source: Feinberg, M. & Willer, R. (2010) Apocalypse Soon? Dire messages reduce belief in global warming by contradicting just-world beliefs. Psychological Science. Doi: 10.1177/0956797610391911.